About Susannah... Susannah has been an Interior Designer from the age of 12, when she drew her first architectural plan for a dollhouse. Since then she has explored many avenues as an artist, including painting, photography, and jewelry design. Her Jewelry Designs were featured in a national magazine, as well as numerous Chicago newspapers. She also established a national market for her work, including sales to the Art Institute of Chicago, the Minneapolis Institute of Arts, and the Milwaukee Art Museum. Susannah brings a unique artistic and technical perspective to her work as an Interior Designer. Education and Experience... Susannah has been an Interior Designer for over twenty-five years. Her professional career began when she attended Northwestern University, where she majored in Interior Architecture and Design. A native of Louisiana, she designed and directed the opening and five subsequent expansions of a family business which included gift, furniture, and interior design departments. She is an award-winning window designer, and her interior design work has been featured in several Louisiana publications. While in Louisiana, Susannah initiated a church renovation project for her local branch church. Beginning with the Reading Room, the project grew to include the addition of a new church sanctuary and the renovation of the old space into a new Sunday School. Susannah has extensive experience in renovation and new construction. She has re-designed numerous residences and commercial spaces, collaborating with architects, contractors, and trades-people. Her work can be found in Louisiana, Illinois, Tennessee, and North Carolina, where she now resides with her husband and daughter. 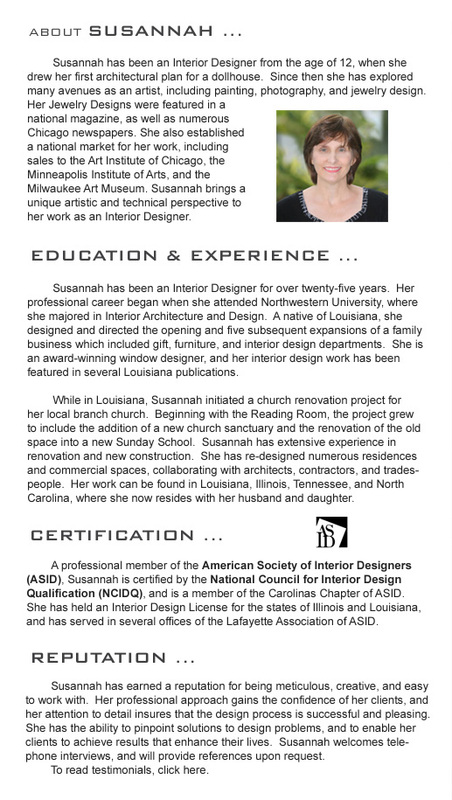 Certification... A professional member of the American Society of Interior Designers (ASID), Susannah is certified by the National Council for Interior Design Qualification (NCIDQ), and is a member of the Carolinas Chapter of ASID. She has held an Interior Design License for the states of Illinois and Lousiana, and has served in several offices of the Lafayette Association of ASID. Reputation... Susannah has earned a reputation for being meticulous, creative, and easy to work with. Her professional approach gains the confidence of her clients, and her attention to detail insures that the design process is successful and pleasing. She has the ability to pinpoint solutions to design process, and to enable her clients to achieve results that enhance their lives. Susannah welcomes telephone interviews, and will provide references upon request. To read testimonials, click here.